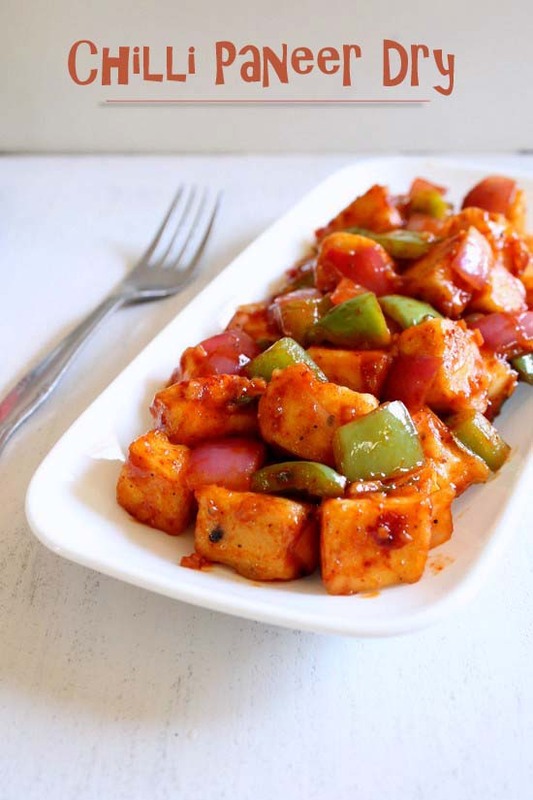 Chilli paneer dry recipe – A popular indo-chinese starter dish that is made from paneer, onion and capsicum. Whenever we go out to Indian Chinese restaurant, I usually order this dry chilli paneer or sesame honey chilli potatoes. Few weeks back I tried to make it at home and we both just loved it. This tastes same as restaurant style. There is another gravy version of it. I will share that some time in future. 1) First make the batter. Take all purpose flour, corn flour, salt, pepper powder and soy sauce in a bowl. 2) Make thick batter by adding 3 tablespoons of water. 4) Mix gently so the batter is coated to the paneer pieces. 5) Heat around 2 tablespoons of oil in non stick pan on medium heat for frying the paneer. Once hot, add paneer and fry. 6) Once it gets light golden color from bottom side, then turn them and fry other sides as well. Once done, remove it to a plate and keep it aside. 7) Before start making chilli paneer, prepare the sauce mixture. Take soy sauce, ketchup, chilli sauce and vinegar in a small bowl. 8) Mix well and keep it aside. 9) Heat the remaining oil in the same pan on medium heat. Once hot add chopped garlic, ginger and green chilies. 10) Saute them for a minute or two. Or till the raw smell of them goes away. 11) Add onions and saute for 2 minutes. 12) Then add green pepper and saute for 2 minutes. It should be crunchy and under done. We don’t want soft and cooked. 13) Then add prepared sauce mixture, salt and pepper. 14) Mix well and let it get heat up. remove it to a plate and serve immediately. You can garnish with chopped green onion’s green part only. I didn’t have handy, so I skipped it. Serving suggestion: Serve as a starter for your indo-chinese meal. Here I have shallow fried the paneer and made healthier version. But to get the best taste, deep fry them. When you cut the veggies and paneer, make sure that all of them of same size. Cube of paneer and chunks of veggies should have same length and width so it looks good other than that there is no reason for doing it. The onion and pepper should be on underdone side. For any indo-chinese recipe, veggies should be crunchy. Mixing the sauces ahead of time in a bowl will make the job easier. If you measure and add sauces one by one in the recipe. It will take some time and meantime onions-peppers will get cooked and becomes soft. We don’t want that. 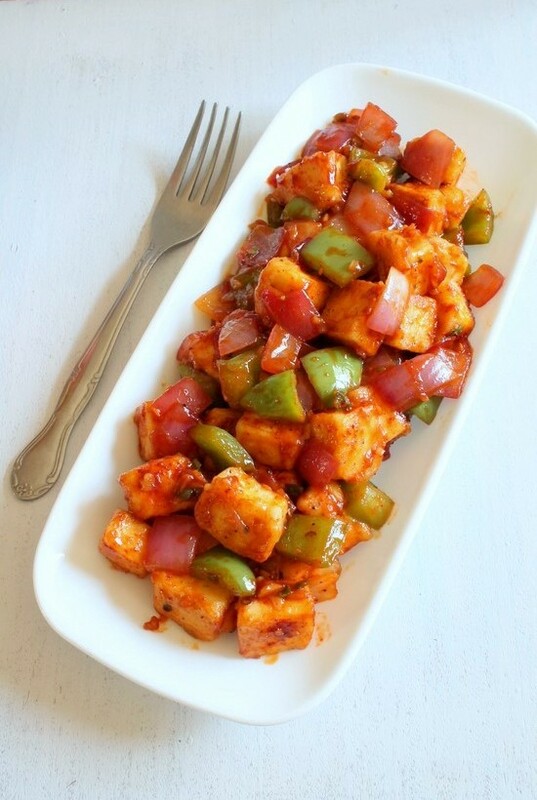 For variation and good looking Chilli Paneer, add colored bell pepper like red pepper or yellow pepper. First make the batter. Take all purpose flour, corn flour, salt, pepper powder and soy sauce in a bowl. Make thick batter by adding 3 tablespoons of water. Mix gently so the batter is coated to the paneer pieces. Heat the oil in non stick pan on medium heat for frying the paneer. Once hot, add paneer, arrange them on single layer and fry all the sides. Keep turning and frying till all the sides are golden brown. Once done, remove it to a plate and keep it aside. Take soy sauce, ketchup, chilli sauce and vinegar in a small bowl. Heat the remaining oil in the same pan on medium heat. Once hot add chopped garlic, ginger and green chilies. Saute them for a minute. Then add green pepper and saute for 2 minutes. It should be crunchy and under done. We don’t want soft and cooked. Then add prepared sauce mixture. Mix well and let it get heat up. Add fried paneer. Mix well and let it get heat up all the way through. Very glad to know that you liked.